Boxing's only eight-division world champion, Manny Pacquiao, and former four-division world champion Adrien "The Problem" Broner went face-to-face Wednesday in Las Vegas at the final press conference before they battle for Pacquiao's WBA Welterweight Title Saturday, January 19 in the main event of a Showtime PPV event from the MGM Grand Garden Arena. 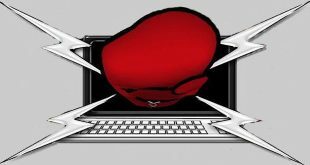 The PPV begins at 9 p.m. ET/6 p.m. PT and will feature two-division world champion Badou Jack battling unbeaten top-rated contender Marcus Browne for the WBA Interim Light Heavyweight Title, former world champion Rau'shee Warren taking on France's Nordine Oubaali for the vacant WBC Bantamweight Championship and unbeaten WBA Interim Featherweight Champion Jhack Tepora defending against former world champion Hugo Ruiz. "I feel so blessed and happy because of the excitement around this fight. It's come from the fans here in the U.S. and media all over the world. I want to go out there and make all the people happy. "The knockout in my last fight felt good. It felt like my younger days against Ricky Hatton, Miguel Cotto and others. That fight was a big challenge for me to recover from the fight against Jeff Horn. People said that my career was done. But I never got discouraged, I just worked hard and made the knockout against Lucas Matthysse happen. "These days I don't only train my body, but also my mind. I'm a Senator, so my mind is very busy. I also play chess regularly and read books to keep my mind sharp. 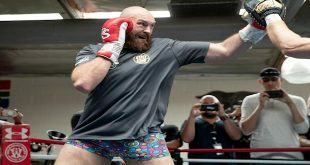 "People writing me off after the Jeff Horn fight was good for me. I'm not mad at anyone who thought that. It just became a challenge and a test to me of whether or not I could still show my best. "Being back here at MGM Grand makes me so happy. It's an honor to be in this position. I remember my first fight here in the U.S. was at MGM Grand. I will never forget that moment and now I get to come back here and do it again. "I know he is going to counter me but we're ready for that. What happened in the Juan Manuel Marquez fight will not happen again. It was a mistake and I learned that mistake. We've worked on that in this training camp. I am prepared for Broner's style. "This is a challenge because it is my first fight as a 40-year-old. I have something to prove to everyone about what that means. Age is just a number. What matters is how you prepare and that you're working hard. "I don't need to dislike my opponent to want a knockout. I'm just doing my job in the ring. If the knockout comes, it comes. We're hoping to have that opportunity Saturday. I have to pressure him to make him open up. Wherever he goes, I'll be there. "I've always stayed disciplined throughout my years in boxing. I'm always making sure everything is in order and on point during my workouts. That plus cross-training with activities like basketball has helped me stay in this position all these years." "I'm not up here to talk a lot of trash. I've put in the work. It's fight time. After I win, everything is going to be different. "People are talking a lot about Pacquiao fighting Floyd Mayweather again, but I'm pretty sure Floyd is retired. I feel like people are trying to throw me to the wolves and overlook me. "He doesn't remind me of any past opponents just like I'm not going to remind him of anyone he's fought. He's never fought anyone like me. Every fighter has similarities, but truly every fighter is different. If I remind him of Floyd Mayweather, I hope his arm doesn't hurt after this one. "Look at my last five fights. I've fought world champion after world champion. I don't duck any fights. I don't care how many weight classes he's won titles in. "I'm not in awe of any fighter, especially Manny Pacquiao. I hope he's in awe of me. I'm a one of a kind fighter too. I've made history in this sport. "I just have to go out and win this fight, then everything is going to start going my way. Saturday night, I will be victorious. This is a defining moment in my career and it's going to be one of the biggest nights of my life. "Pacquiao hasn't fought me so I'm not worried about what he says about me right now. He's going to have a different outlook after he fights me Saturday night. "I'm going to turn Las Vegas into a big block party after I win on Saturday night. It's going to change my career. "Manny Pacquiao has done a lot for the sport. I'm going to beat him up and have a drink with him afterward. I grew up in boxing and I know what's going on. It's a business, but don't get it twisted, I'm going to dominate and win. "This is going to be a hell of a fight. I've trained so hard and I want everyone to know that I play around a lot, but when that bell rings, I'm going to be ready. I didn't come here to lose or lay down. I came here to get this victory. Real talk." "I'm very thankful to this great team that we have that has prepared Manny for this challenge. I know that we worked very hard for this. I cannot fly without wings, but I can bring the belt back to the Philippines. "Manny has trained hard and we expect a good fight. This is the hardest I've seen him train and it will be seen in the ring Saturday night"
"We've trained really hard for this fight. Manny is looking really good and is in tremendous shape. I'm sure Adrien is also because they're both great fighters. I wish both men luck and may the best man win." "We've had a tremendous training camp. Adrien is ready to go. Everyone who knows me, knows that all I have in this world in my word, and I don't break it for nobody. I'm giving you my word that Adrien will put on a spectacular performance on Saturday night. "I'm guaranteeing that Adrien will send Manny back to the Senate, beltless, without the WBA title. I guarantee it." "Adrien came to me when he was 55 pounds and seven-years-old. He was an underdog then and he came back day after day. People thought he was a bad kid, but I told people that I saw something in him. "Freddie Roach didn't know who Adrien was years ago when we were getting ready to work with the Olympic team together. But he got to know Adrien, and on Saturday night, Manny is going to know him too. That's for sure." "We are honored, humbled and proud to be a part of this amazing event. This will be Manny's 20th fight in Las Vegas and we've been treated amazingly throughout the entire promotion. I'm thankful to all of Team Pacquiao for the work they do and helping make everything run smoothly. "We all know that Adrien is ready and we expect nothing but the best from him and his team on Saturday night. "MGM Grand is known for the lion, and Lenny the Lion is right there when you enter the building. On Saturday night, Manny will show his heart of a lion for fans all over the world and prove once again that he's the king of the jungle." "About three and a half years ago I sat here opposite this great legend in Manny Pacquiao. I've studied this man for many years and today he's still one of the best welterweights in the world. He still has tremendous explosiveness and power, but more importantly the experience to beat any welterweight in the world. "Pacquiao has been doing this for so many years that we forget how truly great this man is. He's in a very comfortable position right now. He's super motivated and thats what is going to make this a great fight on Saturday night. "Coming into this fight we all know that there have been rumblings about what Adrien needs to do to win this fight. But what I've witnessed firsthand this entire promotion, is that this man has dedicated himself 100 percent. He's done everything his coaches have asked of him and he's exceeded those expectations. "Adrien Broner is ready, focused, and he's put in the work. He's put himself in the best situation to be successful on Saturday night. I expect nothing less than a great virtuoso performance. He didn't cut one corner this training camp. He wants to prove to everyone, that everything people have said about him can be thrown out the window. He's coming to show the entire world what he's all about." "Adrien trained really hard for this fight. I'd like to thank Kevin Cunningham and Mike Stafford, they put together a great game plan. Adrien will be ready. "There's been a lot of talk from Pacquiao's side about getting a knockout, but you're the one getting knocked out. You've been knocked out, we haven't. "This our first time on this stage and in this position and it's been very enjoyable. Adrien and I have put a lot into this over the last 10-15 years. We're pulling for our guy 100 percent." "I'm not going to come up here and tell you all anything you don't already know about Manny Pacquiao or Adrien Broner. These are two guys who have operated at the highest level of boxing for years. In Manny's case, literally decades. But I will remind you of some things. "Manny Pacquiao is a Hall of Famer, no question about it. He's a boxing legend who's generous, humble and soft-spoken outside of the ring. But most of all, he takes tough fights. The last 20 opponents Pacquiao has had have been current, future or former world champions. "Adrien Broner has faced nine world champions in 37 career fights. He's obviously demonstrated himself as being an elite fighter. He's flashy, flamboyant, sometimes outrageous, but he's always unapologetically himself. "On Saturday night, everything changes. 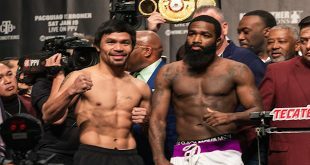 Pacquiao is no longer soft-spoken and Broner is no longer fun-loving and outgoing. They transform themselves into two of the most athletically gifted and ferocious warriors in our sport. Above all these two guys have heart, which is the rarest thing in this sport. "Between the two of them, they've won titles in 12 weight divisions. That's the third most of all-time, trailing just Mayweather vs. Pacquiao and Pacquiao vs. De La Hoya. "We know this is an elite fight and these fighters are in elite company. But on Saturday night, none of that matters. It's not a contest of who has the best resume. This is a high level contest with high stakes between two of the most talented and athletically gifted fighters in the sport today. A win in this fight catapults each of these men to bigger things. It doesn't get any more significant than that." "I'd like to welcome back Manny Pacquiao and Adrien Broner, two of the sport's best fighters, back to Las Vegas and MGM Grand. Fans are always excited to watch these two fighters compete in the ring and we're confident that Saturday's event will kick off another exciting year of sports and entertainment programming for MGM Resorts.